“It was his own grandmother who fed Henri-Pierre to the Cabinet of Earths, long ago when he was only four.” Anne Nesbet’s fantasy novel instantly hooks readers with this opening line and keeps them engaged throughout the entire story. 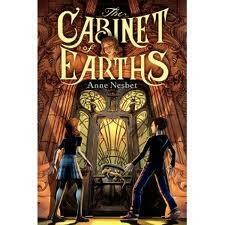 Although it opens up with poor Henri’s tale, thirteen-year-old Maya and her five-year-old brother James take center stage when they move to Paris and discover the Cabinet of Earths and its sinister secrets. Henri’s ancestors found a way to merge science and magic and to use that merger to achieve immortality, but at a terrible cost. Maya has enough on her plate, dealing with her mother’s cancer, homesickness, and jealousy, but the Cabinet of Earths chooses her as its next keeper. She must decide between saving her mother’s life and doing what she knows is right. Nesbet has written a unique, interesting fantasy with just enough suspense to keep readers turning the page long into the night. The language is descriptive and lively; the Cabinet of Earths and the mysterious Henri-Pierre’s house leap off the pages. Fantasy readers of all ages will enjoy this story, especially middle school students.